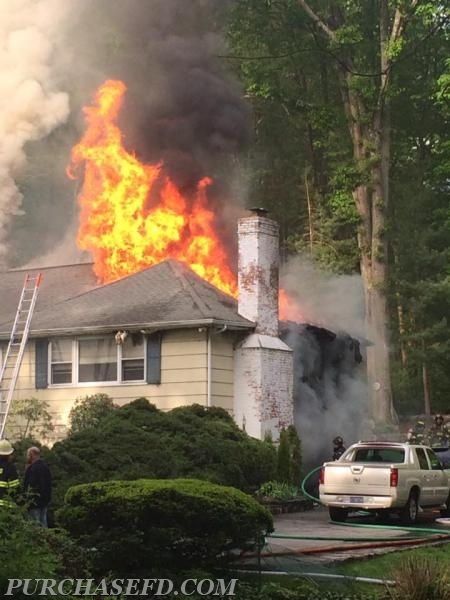 Saturday May 21st, at 17:32 hrs, West Harrison and Purchase Fire Departments were dispatched to 6 Glen Park Road on a reported structure fire. In route, dispatchers updated FD units, reporting heavy fire conditions. 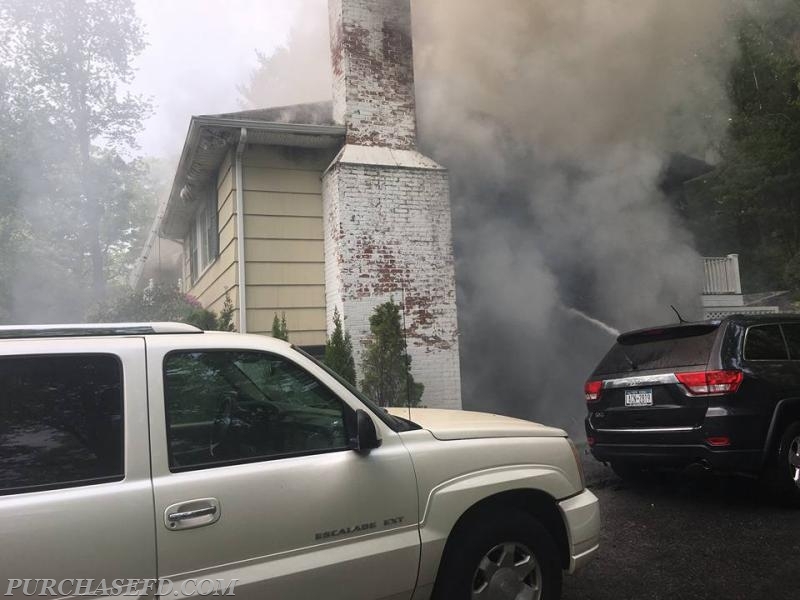 On arrival, firefighters were faced with a fully involved attached garage fire, which had extended up the exterior vinyl siding and into the attic. Three vehicles were also involved, one in the garage and two in the driveway. All occupants had self evacuated prior to FD arrival. 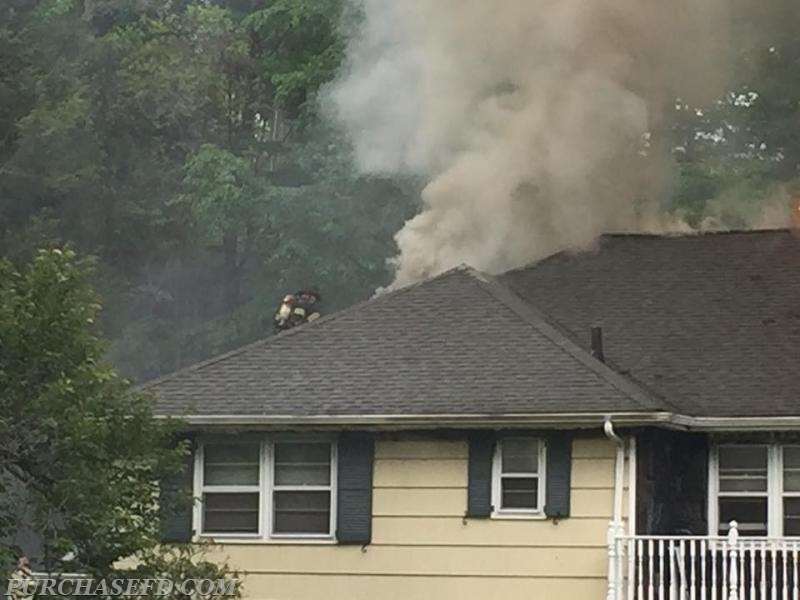 Several lines were stretched to knock down the initial heavy volume of fire in the garage, and it took hours to fully extinguish the large fire load in the attic. Glen Park Road is located in the West Harrison Fire District. However, this neighborhood which borders both Purchase and West Harrison Fire Districts, is in a “Dual Response Zone.” It is one of several areas between the two fire districts which receive an automatic response from both departments. The automatic mutual aid agreement between the two fire departments has been in place for several years. It was intended for incidents such as this, when it is ideal to have additional manpower on scene in the first minutes of an operation. This incident also required the assistance of several other fire departments, who were either called to the scene or to back fill the stations. Resources responded from Port Chester FD, North White Plains FD, Valhalla FD, Town of Mamaroneck FD, Larchmont FD, Village of Mamaroneck FD, Armonk FD, and Harrison EMS.